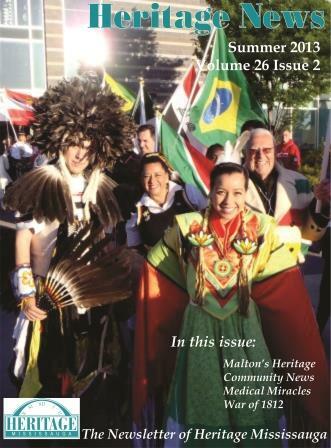 First published in 1987, the Heritage News is a publication of Heritage Mississauga, connecting members and residents with upcoming Heritage Events, Heritage Issues, news, and articles of interest connecting to the history of the City of Mississauga. Please contact history@heritagemississauga.org if you have an article or story you would like to submit for publication consideration, or if there is a particular subject of interest that you would like to see documented in the publication. The Heritage News is distributed to Heritage Mississauga members, and is available at libraries and community centres throughout the City. You can also pick up the latest edition, or past editions, of the Heritage News from the Heritage Mississauga offices at The Grange. The publication is also available online and via email. If you wish to advertise in the Heritage News, please contact info@heritagemississauga.org for more information and advertising rates. First published in 1987, the Heritage News is the publication of Heritage Mississauga.